The Jakarta Globe reported on November 19, 2012 that surging waters following torrential rains in Jakarta killed at least one person. The floods caused structural damage to some buildings, crippled traffic and inundated many parts of Jakarta. Floods have become a threat and brought woes for Jakarta residents every year. In 2007, the worst floods in memory inundated about 70 percent of Jakarta, killed at least 57 people and sent about 450,000 fleeing their houses. In 2008, floods inundated most parts of Jakarta including the Sedyatmo toll road and nearly 1,000 flights in the Soekarno-Hatta International Airport were delayed or diverted and 259 were cancelled. Earlier this year, floods inundated hundreds of homes along major Jakarta waterways including the Ciliwung, Pesanggrahan, Angke and Krukut rivers and displaced 2,430 people (The Jakarta Globe, April 5, 2012). In the aftermath of these annual floods, the government usually focuses on releasing floodwater as quickly as possible into the sea, particularly on the development of the East Flood Canal and dredging of rivers. Similarly, Governor Joko Widodo laid out his plan to improve the East Flood Canal, the drainage in Cengkareng and Pesanggrahan and develop a reservoir for reducing the flow of the Ciliwung River (The Jakarta Globe, November 19, 2012). The East Flood Canal was launched in the aftermath of major floods in 2002 and reached the sea on December 31, 2009 after a very slowly progress due to the complicated land acquisitions. 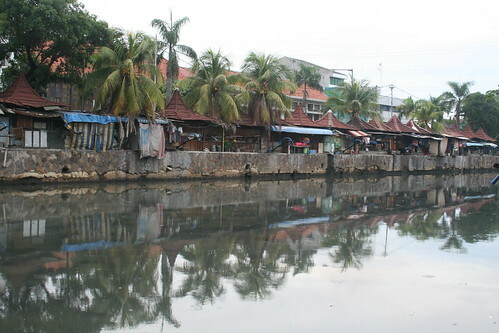 The East Flood Canal has been considered the most feasible means to prevent future flooding in Jakarta, but clearly cannot prevent flooding entirely. The canal, coupled with the dredging of rivers, is only able to mitigate impacts of flooding. Averting floods in Jakarta is quite a big challenge since Jakarta lies in a lowland area with 43 lakes and 13 rivers with a population of nearly 10 million within the city's boundaries and more than four million in neighboring areas. Two centuries ago, the Dutch colonial government, with its long experience in controlling water and drainage systems, built a canal system to protect the city's population which was then 500,000. 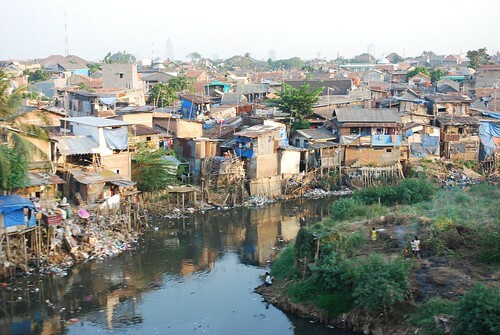 The annual floods in Jakarta are strong evidence that Jakarta has not been able to sustainably accommodate its growth. Jakarta needs bold moves to prevent future flooding. For many years, new homes, commercials and office buildings have proliferated across the city and many of them have converted water catchment areas, green areas and wetlands. Land conversions from water catchment areas, green areas and wetland to urbanized areas in Jakarta and its neighboring areas must be stopped. neighborhood., originally uploaded by omae. The city administration should promote the concept of infill development within urbanized areas. Sprawl development or outward expansion of development should be discouraged. New developments in Jakarta should be directed to vacant, underdeveloped or underutilized sites rather than undeveloped land including water catchment areas, green areas and wetland. Zoning regulations (Peraturan Zonasi) should encourage the application of infill development in vacant, underdeveloped or underutilized sites. Zoning regulations that limit building heights could become regulatory barriers for infill development. The city administration also needs to take bold moves to expand the green areas in the city. In the 1970s, green areas made up between 40 and 50 percent of Jakarta and have been shrinking ever since. Currently, green areas in Jakarta account for less than 10 percent of the city’s total area, far below the target of 30 percent set in the 2007 Spatial Planning Law. Water catchment areas, green areas and wetlands that have been converted into urbanized areas need to be re-functionalized as non-urbanized areas. The cost of converting urbanized areas into green areas may be expensive, but such sacrifices are necessary for the future of Jakarta, including to avert floods.